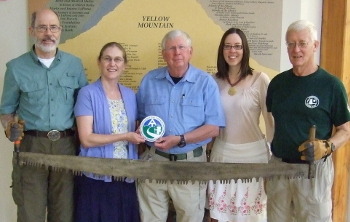 The Macon County Public Library (MCPL) was recognized on June 16, 2014 for its support to the Appalachian Trail Community Program. 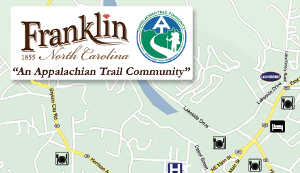 Since Franklin’s formal designation in March 2010 as an A.T. Community, MCPL has helped build public awareness about the significant resources and economic opportunities the Appalachian National Scenic Trail brings to Franklin as an A.T. Community. The library’s two week long “Walking With Spring Program” in late March and early April, corresponding with the middle of thru-hiker season in Franklin, highlights the A.T. and its hikers. Additionally, the MCPL offers free internet access to A.T. hikers and supports many programs offers by the Franklin based Nantahala Hiking Club (NHC). The A.T. Community Supporter Program is offered by the Appalachian Trail Conservancy (ATC) at part of its A.T. Community Program. The Community Supporter Program highlights non-profits, organizations, and businesses that provide support to the hiking community, the Appalachian Trail and/or the ATC by recognizing participating entities as “A.T. Community Supporters.” For more information contact Kristina Moe (​kmoe fontanalib.org) at Macon County Public Library. Franklin Trails Days is a month long celebration of Franklin's appreciation for the Appalachian Trail Hikers. Along with our "Walking with Spring" program at the library, there are many events throughout Franklin that celebrate hiking. See the Franklin Trail Days - Schedule of Events for more information.